Employees who refuse to relocate to a new branch for their company can use this printable letter to resign. Please accept this letter as notice of my resignation from my position of telephone sanitizer effective July 15. The reason is that our personal situation does not let me accept the proposed relocation of my function to Dallas. We have lived here for quite a few years and have made many friends and become deeply involved in the community. Our children are at the age where they would find a move very disruptive. We have spent a great deal of time at home discussing the situation, to decide as fairly as possible. If I were to move, my wife would have to give her job up or else we'd have to separate for an undetermined period of time. We are not willing to do either of these. On balance, we feel that it would not be a good move for our family to undertake. I have no complaints about my time with the company and I'm sad that I have had to make this decision. If I can be of any help with my replacement, let me know and I'll do what I can. DISCLAIMER: The resignation letters and articles contained on ResignationLetters.biz are not to be considered as legal advice. All content is for informational purposes, and Savetz Publishing makes no claim as to accuracy, legality or suitability. The site owner shall not be held liable for any errors, omissions or for damages of any kind. 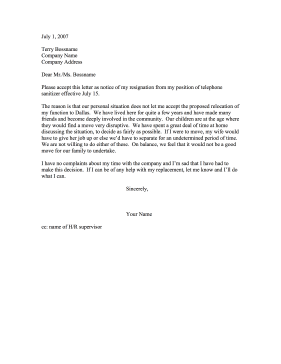 This Resignation Letter is easy to download and print. Just download one, open it in Acrobat Reader, and print. Also available: more free printables including resume templates and complaint letters. If you don't see a resignation letter or category that you want, please take a moment to let us know what you are looking for.